Ten years ago, black Lab mix Abby ran away from home. Now, she has been reunited with her owner Debra Suierveld, who tells NPR's Scott Simon that Abby has fit right back in with the family. "They said, 'We have your dog,' " Suierveld tells NPR's Scott Simon. "And I said, 'That's impossible.' "
The shelter told her they had a female black Lab mix. Suierveld, who had gotten other dogs since Abby's disappearance — including another black Lab — said her dog was at home. But the shelter had run the dog's identification microchip — and her name was Abby, they said. Suierveld was shocked. "I was like, 'Abby?' I said, 'I haven't seen her for 10 years,' " Suierveld says. Once Abby rejoined their family, it was almost as if she had never left. "She settled right it, I'd say," Suierveld says. "The first night, I have other dogs, and they were all lying in the family room like they'd been spending the last few years together." Suierveld says Abby is probably the smartest dog she has had. The other night she heard Abby in the kitchen, tapping on her bowl asking for more water. Suierveld's daughter, Carly, was 12 years old when Abby left. Abby was her favorite, Suierveld says. Carly taught Abby all her tricks — and she still does them. Now 22, Carly is coming home from college later this month to reunite with Abby. When her mom called her with the news, Carly couldn't believe it. "She was laughing so hard that by the end of the laugh she was crying," Suierveld says. Suierveld says she doesn't know who kept her all these years, but she doesn't blame them. "She's just such a sweetheart," she says. "I just wish they had checked her for a chip because we would have had her back so much sooner." A dog named Abby is back from the dead. 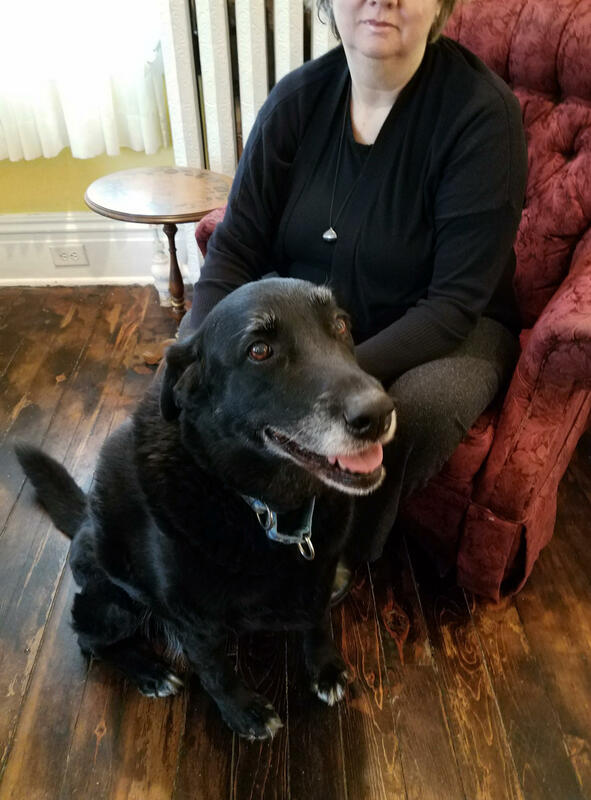 Abby, a black lab mix, wandered away from her home in Apollo, Pa., just outside of Pittsburgh, ten years ago. Abby's owner Debra Suierveld and her children looked for their dog but couldn't find her, accepted her loss and had her declared deceased. But ten years later, they got a phone call from an animal shelter. Debra Suierveld joins us now from Apollo, Pa. Thanks so much for being with us. SIMON: What did they say at the animal shelter? SUIERVELD: Well, the Allegheny Animal Rescue called me. And they said, we have your dog. And I said that's impossible. And she said, well, we have your dog. It's a female black lab mix. And I also have a black lab mix at home. And she said wait a minute. We ran the chip. We have her dog. Her name is Abby. I was like, Abby? I said, I haven't seen Abby for ten years. So I was pretty shocked. SIMON: How is Abby adjusting to life back with you? I mean, on top of everything else, it's been 10 years since she's been in that house. And your daughter, I gather, was - what? - 12 years old, right? SUIERVELD: That's correct, yes. She settled right in. I'd say the first night - I have other dogs. And they were all lying in the family room like they'd been spending the last few years together. SIMON: ...Does Abby remember her? Does she remember Abby? SUIERVELD: Well, that's to be seen. My daughter is at Miami University in Ohio. So she plans to come home. I think she said the weekend of the 22nd. That'll be a big reunion. She's excited. Abby was her favorite dog. Carly trained her and showed her tricks, and she still does them. SUIERVELD: (Laughter) She started laughing. And she was laughing so hard that I - by the end of the laugh, she was crying. She's like, I can't believe it. So yeah, she's real excited. SIMON: Well, it's possible that more than one person knew that she was a great dog and took care of her and hoped that this reunion might happen someday. SUIERVELD: I wouldn't be surprised. I mean - and I don't blame them for keeping her because she's just such a sweetheart. I just wish they had checked her for a chip because we would have had her back so much sooner. SIMON: Yeah. Debra Suierveld from Apollo, Pa. - thanks so much. (SOUNDBITE OF PENGUIN CAFE ORCHESTRA'S "DIRT") Transcript provided by NPR, Copyright NPR.